Vince Velasquez was "dominating" against the Blue Jays vaunted lineup in Dunedin on Monday. "He made some really good hitters, I don’t want to say look bad, but almost," Darin Ruf said. "He was blowing it by some of the best fastball hitters in the game"
DUNEDIN, Fla. – Vince Velasquez said he was taking a little “snooze” on Monday morning inside the home clubhouse at Bright House Field, trying to chill out and not think about the formidable lineup he was about to face 15 minutes up the road in Dunedin, or about the impact the game could have on where he might end up when the Phillies departed Clearwater in a little more than 48 hours. Maybe he’d win the rotation spot after all. Perhaps he’d have to start the year at Triple-A Lehigh Valley. Almost everyone knew about 3 1/2 hours before the first pitch of Monday afternoon’s game, though. 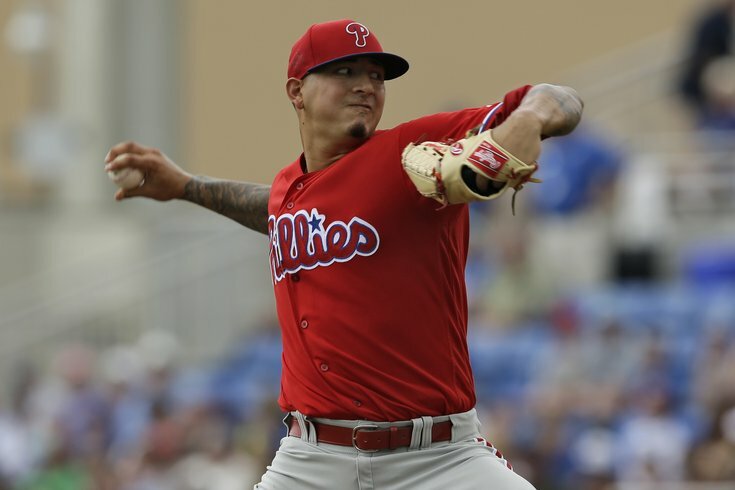 Velasquez was named as the final piece of the Phillies starting rotation once Adam Morgan was among the players shipped off to minor league camp. Velasquez saw a notification on his phone and was then stirred to life when reliever Chris Leroux, one of the players sent down, congratulated him. Velasquez was exhausted because he had just got finished cruising through what arguably the best lineup in baseball with relative ease. He held the Toronto Blue Jays – with every starter in the lineup other than Edwin Encarnacion – to two hits and three walks in six shutout innings of an eventual 2-1 loss. Of the 21 Blue Jays batters that came to the plate against him Monday – including Donaldson, Jose Bautista and Troy Tulowitzki – Velasquez struck out eight. “Dominating,” said Darin Ruf, who hit a solo home run in the seventh inning. “He made some really good hitters, I don’t want to say look bad, but almost. He was blowing it by some of the best fastball hitters in the game, and really mixing it well, using his changeup and breaking ball." He spotted a fastball on the outside corner against reigning American League MVP Josh Donaldson for his first strikeout of the day in the first inning and blew another by Chris Colabello to cap a perfect frame in the fourth. Armed with a mid-90s fastball, Velasquez pitches with an edge and a cockiness that you can argue hasn’t been seen in a Phillies pitcher since a young Brett Myers. Sure there have been many talented pitchers to take the mound at Citizens Bank Park in the last decade, but it’s difficult to think of one that’s jumping off the mound after each strikeout, not to show anyone up, but because of what appears to be an endless supply of adrenaline. Velasquez said he was both “drained” and “overwhelmed” on Monday. Perhaps that’s expected because of the style he brings to the mound and the decision that was looming. He seemed to react fine between the lines, which had to be pleasing to the eyes of Mackanin and the front office. Velasquez has often been described as the prize of the December trade that sent Ken Giles to Houston but still has a lot to prove as a pitcher with just seven big league starts on the back of his baseball card. Perhaps the biggest question is whether he can be durable over the course of a 162-game season. Velasquez, who underwent Tommy John surgery before the 2011 season, his first season after being drafted in the second round of the 2010 draft, pitched a total of 88 2/3 innings last season between the Astros and Double-A Corpus Christi. He hasn’t thrown more than 100 innings in a season since 2013 in A-ball (124 2/3 innings). Most pitchers that hope to stick in a rotation, from April through September, set 200 innings as a standard goal. Is he capable of making it through that rigorous workload? It was easy to say for a kid who skipped Triple-A on his way to the big leagues and nearly made the Jays vaunted hitters looks like Little Leaguers on Monday afternoon in Dunedin.